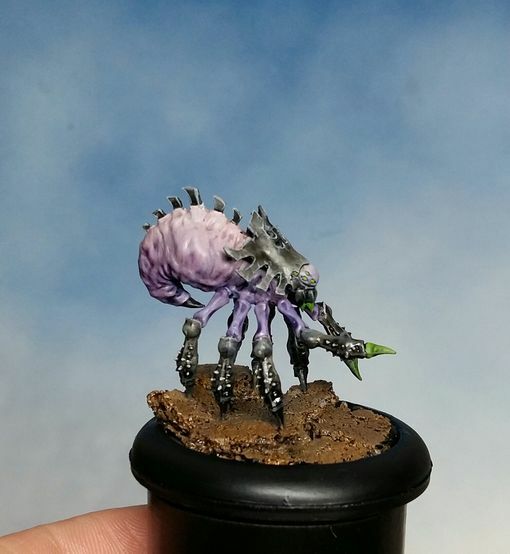 Voici un court pazapa sur la mise en couleur de cette araignée de la Shadow Caste des Dragyris pour Dark Age. Tout d’abord voici la bête. Il n’y a rien d’exceptionnel ici, mon tuto vise comme souvent à donner les étapes pour une peinture rapide. Je voulais surtout avoir un rendu pour le corps qui donne envie d’écraser l’insecte sous sa semelle. Je suis plutôt satisfait de ce côté-là, un essaim de telles araignées sur la table devrait faire son petit effet! 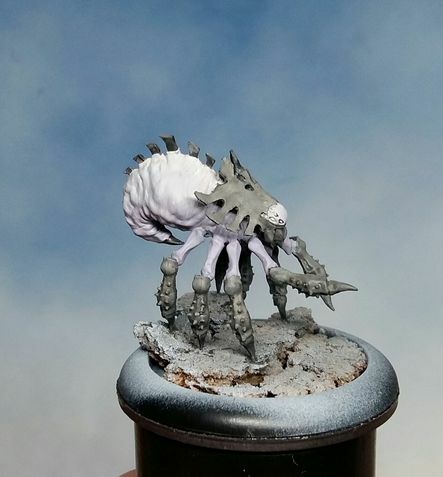 Here is a step by step regarding the painting of that spiderling. 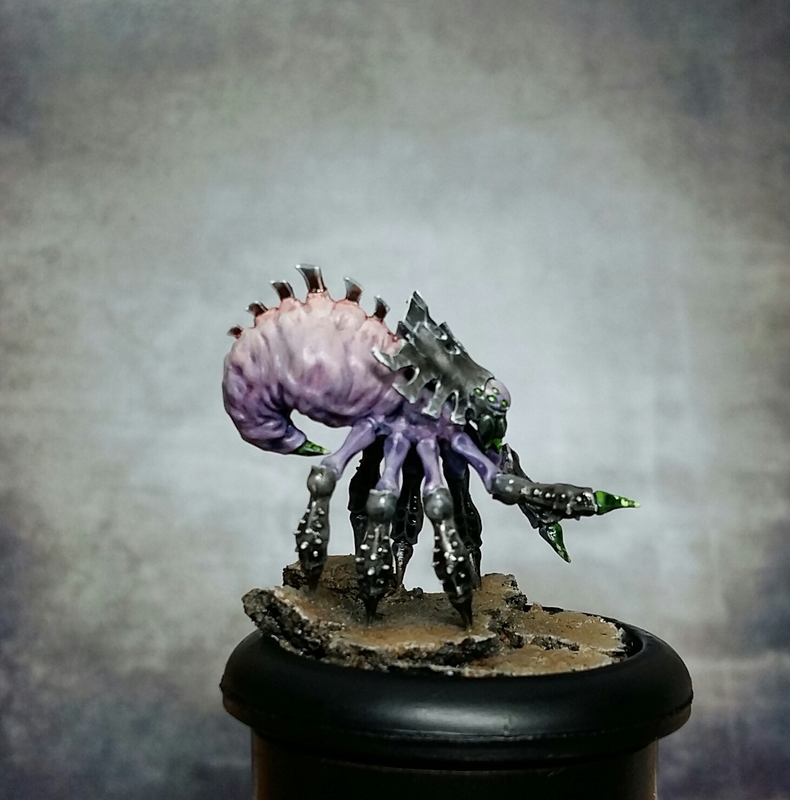 There are a lot a tutorials on the net explaining how to paint a showcase mini…I often prefer giving hints on how to paint a mini within a couple of hours. 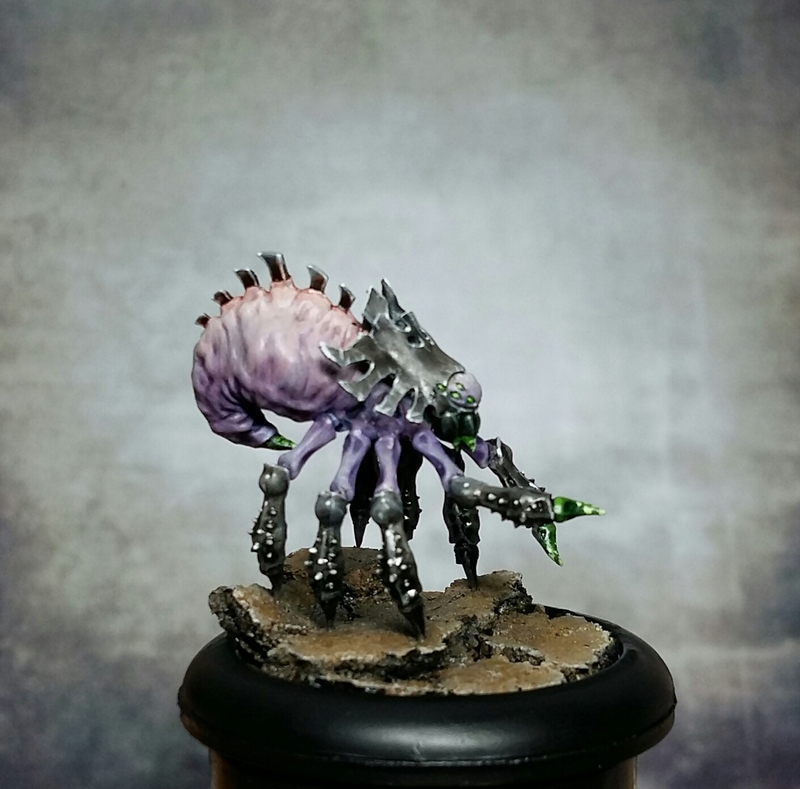 This spiderling was made in less than two hours. You could achieve it quicker of course, but I usually try to reach a time-quality ratio I am happy with. 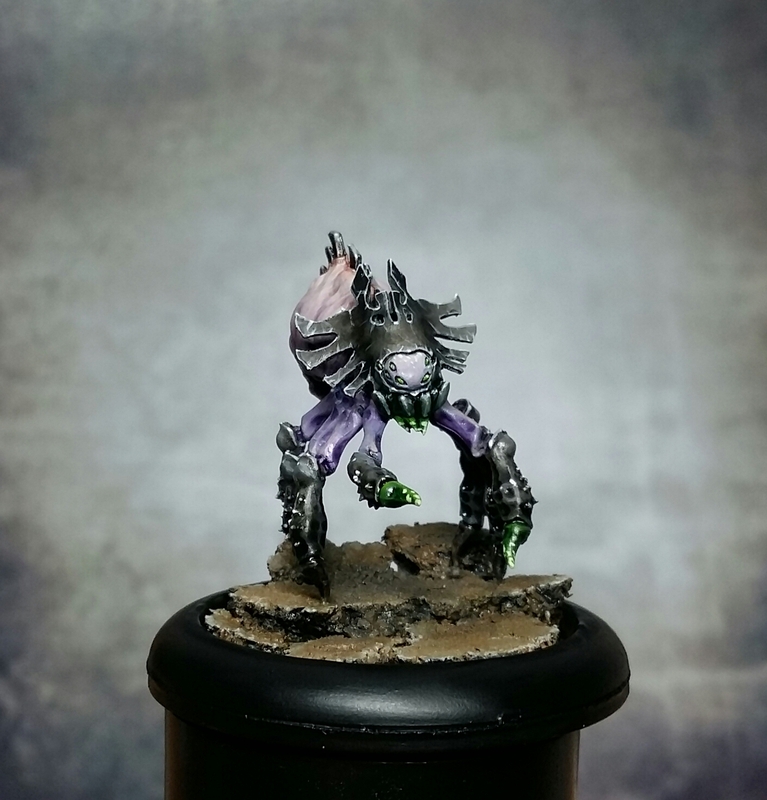 For quick paintings, I recommend to use the wet blending technique which allow to achieve blendings really quickly (actually i also used the wet blending technique for longer paintjobs, for instance Hood below). For a reminder, the wet blending is about mixing slightly diluted paints directly on the mini itself, rather than on your palette. It’s quite fun when you are used to it. Not easy at the beginning – a bit destabilizing – but actually really convenient afterwards because your are not trying to find the perfect level of dilution in order to reach an immaculate blending after your hundredth wash! 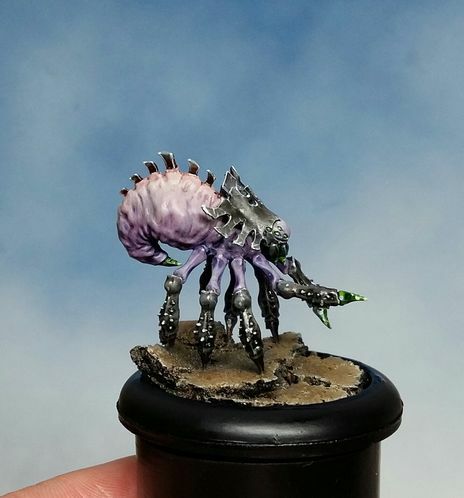 Regarding the color scheme, the objective with this painting was to make one want to squash this spider under the shoe! I am happy with the result. 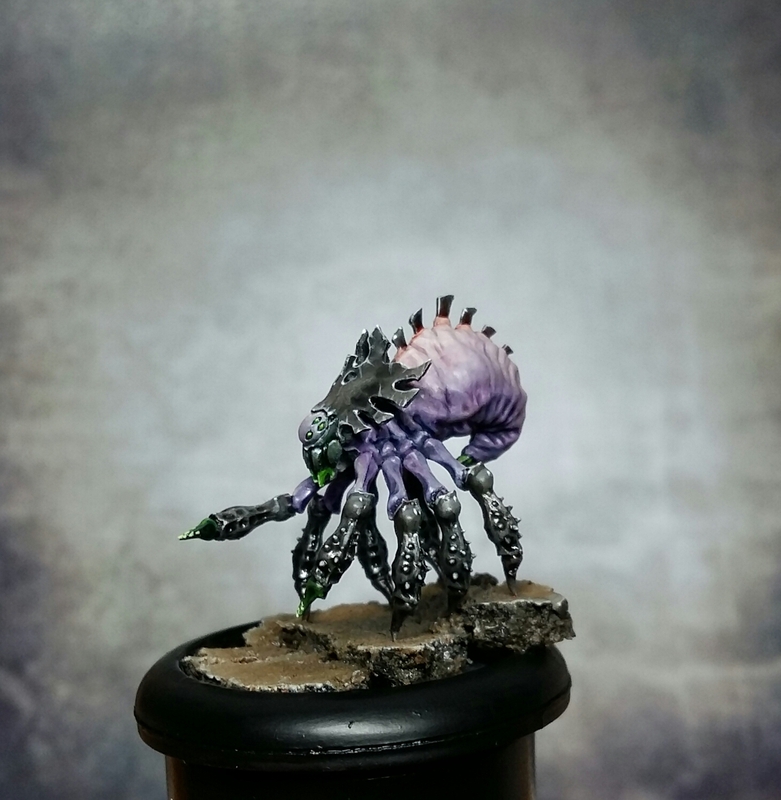 A swarm of such spiders will certainly have its visual impact on the table. That being said, detailed comments are directly inserted below each picture in the gallery.